At about 10:00 AM on Tuesday January 15, 2019, members of the Boston Police Drug Control Unit and Auto Theft Task Force arrested Jason Martinez, 24, of Dorchester and Dionna Caruthers, 20, of Dorchester on drug related charges as part of an investigation in the area of Tower Street and Hyde Park Avenue in Hyde Park. Officers applied for and were granted arrest warrants for each of the suspects out of West Roxbury District Court as well as five search warrants out of Dorchester District Court as part of this large-scale investigation. Officers were able to locate both targets travelling in a motor vehicle on Hyde Park Avenue at which time they performed a traffic stop. Officers removed Caruthers, who was operating the vehicle and Martinez, who was in the front passenger seat. Officers were then able to safely recover one medium sized bag of heroin with an approximate weight of 10.8 grams as well as one plastic bag containing 8 small bags of heroin in addition to another plastic bag containing 6 small bags of heroin. Officers also seized $3,640.00 in U.S. Currency and other evidence. Both parties were taken into custody without incident and will appear in West Roxbury District Court on charges of Trafficking Class A Drugs, Distribution of Class A Drugs, Possession with Intent to Distribute Class A Drugs and Conspiracy to Violate the Drug Laws. At about 1:15 PM on Tuesday, July 24, 2018, an officer assigned to the Boston Police Auto Theft Unit was on patrol in the area of West Dedham and Tremont Street in District D-4 (South End) in a concerted effort to prevent vandals from spraying graffiti and tags on public property, residents’ property, businesses’ property, and vehicles throughout the city. From his training and experience, this officer had specific knowledge of characteristics and common behaviors exhibited by taggers and, on the above date and time, observed an individual, later identified as 19-year-old Logan O’Keefe of Mattapan, exhibiting those behaviors. The officer’s attention was first drawn to O’Keefe when he observed him standing awkwardly near a large green mailbox while holding what appeared to be a whiteout marker in his hand. The officer observed O’Keefe briefly turn toward the mailbox, then walk away. At no time did the officer ever observe a piece of mail in O’Keefe’s hand nor was this a working blue mailbox. As O’Keefe walked farther away, the officer approached to inspect the mailbox and observed a fresh graffiti “tag” on it. The officer observed a similar tag on a second nearby mailbox. The officer followed O’Keefe as he walked onto Montgomery Street, watching as O’Keefe took out a cell phone and took a picture of a third similar tag, this one larger on the side of a residential building. The officer continued to follow the suspect observing him make several more tags, while requesting an additional unit so that he may affect a safe arrest. O’Keefe was in the process of tagging a silver vent pipe in the area of 671 Tremont Street when the officers were able to arrest him without further incident. O’Keefe is charged with six counts of Felony Tagging/Graffiti and will be arraigned in Boston Municipal Court. At about 4:30 PM on Monday, July 23, 2018, officers assigned to the Boston Police Auto Theft Unit made an on-site arrest of a tagging suspect while conducting an investigation in the area of Commonwealth Avenue and Essex Street in District D-14 (Brighton). While on patrol, an officer observed a male sitting on the railroad, dangerously close to the edge of the bridge above the Charles River. The officer was aware from his past experience and from information provided to him by detectives that taggers are prevalent in the area of bridges, railroads, and highways in Allston and Brighton. The officer continued to observe the male to ensure that he would not fall into the water and to determine if he was a “tagger.” The officer then observed the male begin to spray paint the railroad tracks before walking further down the tracks to spray paint a second section. The suspect then walked off the tracks toward a path next to Storrow Drive. The officer immediately noticed that the suspect had sprayed a tag on the bridge. The officer was aware that the tagger of this symbol was the subject of an investigation by a Boston Police detective for a similar tag on the newly renovated Longfellow Bridge. At this point, the officer approached the suspect, identified as 22-year-old Brett W. Cullen of Quincy, and placed him under arrest. Cullen will be charged with two counts of Felony Tagging and will be arraigned in Brighton District Court. The arrest of this tagger marks the second arrest of a major Boston vandal by the BPD Auto Theft Unit in less than a week. On July 16, 2018, officers arrested a 22-year-old male in East Boston by virtue of a default warrant for tagging and three probation violation warrants. At about 12:40 AM on Tuesday, June 26, 2018, officers assigned to District D-14 (Brighton) responded to call for a breaking and entering to a motor vehicle in the area of 48 Strathmore Road. Officers received information that three males were observed cutting the lock off a scooter that was attached to a pole and placing the scooter in a white van. Upon arrival, officers were able to stop the white van as it pulled away from the scene. Officers viewed nearby surveillance video and, on the video, observed the three suspects putting a scooter into the back of the white van after they had cut the lock with bolt cutters. Officers arrested Jose Puente, 21, of Dorchester, Juan Cruz, 21, of Brighton and a juvenile male, 17 of Dorchester, and charged them with Larceny, Possession of Burglarious Tools, and Buying/ Receiving Stolen Goods. All three suspects will be arraigned in Brighton District Court. At about 6:15 PM on Wednesday, May 2, 2018, members of the Boston Police Auto Theft Unit, along with officers from the Massachusetts Environmental Police, were on directed patrol in an effort to address the unlawful and reckless operation of off-road vehicles in the City of Boston. While in the area of Seaver Street and Elm Hill Avenue, an officer observed a male operating a red and white dirt bike without a helmet and registration plate while weaving in between lanes. The officer was unable to make a stop of the suspect at that point but requested assistance from additional officers in making the stop. Officers followed the suspect until the suspect stopped the bike, dismounted, and attempted to enter a residence in the area of 58 Fowler Street. Officers stopped the suspect, a 29-year-old male from Roxbury, and advised him that operating a dirt bike that is unregistered and uninsured on a public way without wearing a helmet is illegal. The officers also observed that the suspect's driver’s license was suspended. Based on these facts, the officers summonsed the suspect to Dorchester District Court for Operating a Motor Vehicle after License Suspended and issued a MA uniform citation for the violations of the auto laws. The dirt bike was towed and impounded. Officers continued patrol, and at about 6:45 PM that same evening, in a separate incident, officers observed a male operating a blue four-wheel ATV in the area of Columbia Road and Stanwood Street. At this time, the operator entered the center lane and performed a stunt maneuver where he stood on the ATV and raised both left wheels completely off the ground. The operator proceeded across two lanes on two wheels before tailgating another car, weaving back and forth behind it, then swerving around it and accelerating. The officer followed the vehicle for several blocks while it committed several traffic violations, then proceeded onto the sidewalk where the operator dismounted. The officer approached the operator on foot, at which point the suspect fled on foot. The officer pursued and observed the suspect push a male passerby off his bicycle. The suspect then stole the bicycle and continued to flee. Eventually, the officers in a cruiser pulled alongside the suspect near 77 Dale Street where he appeared exhausted. The suspect dismounted the bike, and officers placed him under arrest. The suspect, 32-year-old Courtney J. Wood of Dorchester, was charged with Operating a Motor Vehicle after License Suspended (2nd & subsequent offense), Operating an Uninsured Motor Vehicle, Negligent Operation of a Motor Vehicle, Habitual Traffic Offender, Failure to Stop for Police, Unarmed Robbery, Assault and Battery, and Disorderly Conduct. Officers discovered that the ATV engine had been stolen, and the serial numbers on the engine had been altered. Wood was additionally charged with Altering a Motor Vehicle Identifying Number and Receiving Stolen Property. Wood was issued numerous traffic and city ordinance citations for the violations of the auto laws. The ATV was towed and impounded. At about 6:30 PM on Thursday, March 29, 2018, members of the Boston Police Auto Theft Unit in conjunction with the Mass State Police H Troop Community Action Team and the MA Environmental Police, arrested three individuals for violations of the auto laws in the area of Rusfield Street and Mass Ave in Roxbury. While conducting an ongoing investigation, officers observed three males operating dirt bikes recklessly on the public way by committing an array of auto law violations in the above area. Officers had also received several 911 calls that evening describing the unsafe and negligent operation of these dirt bike riders. Officers followed the three individuals to a UHaul storage facility located in the above area and observed the males enter the facility with the bikes. At this point, officers attempted to conduct a stop of the males to no avail. The males fled on foot with the bikes into the facility and the officers pursued. Once inside, officers were able to apprehend the three males without further incident. As a result of the stop, officers seized three dirt bikes, a motor scooter, and a quad off-road vehicle, all of which were illegally and hazardously stored inside the facility. BPD and Boston Fire Department Hazmat Units responded to make the area safe. Officers arrested 24-year-old Jason Martinez, 23-year-old Giovanny Martinez, and 24-year-old Najja Joseph, all of Roxbury, and charged them with Disorderly Conduct, Negligent Operation of a Motor Vehicle, and Operating after License Suspended/Revoked. All three individuals will also be issued citations for the auto law infractions. At about 12:20 PM on Thursday, August 24, 2017, members of the Boston Police Auto Theft Unit began an operation focusing on the District D-4 (South End) neighborhood due to a recent significant increase in motorcycle thefts in this area. While conducting the operation, 911 dispatch advised units of two males observed pushing a green motorcycle from 500 Commonwealth Avenue toward Mass Ave. ATU officers responded to the area but were unable to locate the suspects or the green motorcycle. Further investigation revealed that the green motorcycle had earlier been reported stolen to the Transit Police. Based on this information, ATU officers responded to the residence of a 17-year-old motorcycle thief known to police, who only six weeks prior, was found to have four vehicles stolen from the South End/Back Bay stored in the rear of his residence on Cheney Street in Roxbury. Upon arrival on Cheney Street, officers observed the above 17-year-old male push a motorcycle down the street, lock it to a light pole, and cover it with a tarp before entering his residence. Officers confirmed the vehicle was the stolen green motorcycle. Shortly after, officers observed the 17-year-old male riding as a passenger on a gray and white Honda motorcycle away from his residence with a second 17-year-old male (also known to them as a motorcycle thief with a revoked driver’s license from previous incidents). Officers maintained surveillance, and at about 4:10 PM observed both males return to the area, both operating motorcycles without registration plates. The first male proceeded to abandon his bike and sprint into the residence, while officers were able to stop the second 17-year-old and place him under arrest for Operating after License Revocation (2 counts). Further investigation revealed that both motorcycles had been reported stolen, therefore, he was additionally charged with two counts of Receiving Stolen Motor Vehicle. Complaints will be sought for two counts of Receiving Stolen Motor Vehicles for the first 17-year-old male as well. In all, three stolen motorcycles were recovered during the operation. On Thursday, March 30, 2017, members of the Boston Police Auto Theft Unit, in collaboration with members of the MA Environmental Police, conducted a joint operation to combat the roving gangs of off-road vehicles that have plagued the neighborhoods across the city, particularly Roxbury, Mattapan, and North Dorchester, causing quality of life and safety issues for residents, as well as being a constant source of requests for enforcement by the citizens of these neighborhoods. For example, earlier in the month, officers observed a group of about 20 individuals recklessly operating dirt bikes, ATVs, and mopeds in the area of Blue Hill Ave and American Legion Highway. After riding wheelies, failing to obey traffic signals, weaving between traffic, and operating on sidewalks near pedestrians, one of these individuals abandoned his dirt bike, fled from police, and while doing so, pulled down his pants and underwear to expose himself to police and nearby members of the public. Although this individual made good his escape, officers towed the unregistered, uninsured, abandoned dirt bike. On March 30, officers were able to identify, issue citations, file criminal complaints, and arrest several other individuals for operating unregistered--and even stolen--off-road vehicles recklessly and negligently, ignoring and riding in contradiction to traffic signals, and causing unsafe conditions for residents in these Boston neighborhoods. In the first week of this ongoing operation, officers seized and impounded three off-road vehicles. In the coming spring and summer months, the BPD Auto Theft Unit looks forward to working with multiple state and local agencies to ensure a safe and peaceful summer for Boston’s citizens. This past weekend, Friday, September 16th through Sunday September 18th, the Boston Police Auto Theft Unit in a coordinated effort with officers assigned to District C-6 (South Boston) and members of the Boston Regional Intelligence Center conducted an operation to address criminal drag racing in the area of New Market Square in South Boston. Since February of 2016, there has been a steady increase in this type of activity amid growing concerns from local community members. During these illegal events, large crowds have gathered to watch numerous vehicles including modified cars, trucks, ATV’s and dirt bikes race one another. In the past, any attempts at overt police enforcement resulted in the crowd dispersing in mass, allowing the perpetrators to flee the scene undetected. During this operation, officers were able to gather intelligence on the participants and organizers. As a result they have issued approximately seventy five motor vehicle citations, thirty five criminal complaint applications and have filed Immediate Threat Reports to the Massachusetts Registry of Motor Vehicles to have the licenses of the operators and/or owners of the vehicles revoked. The participants were found to have come from all over the Commonwealth including the North Shore, Lowell, Everett, Lynn as well as local Boston residents. At about 5:30 PM on Sunday, May 15, 2016, officers assigned to the Boston Police Auto Theft Unit, the Walpole Police Department, Massachusetts Environmental Police, Special Agents from the National Insurance Crime Bureau and members of the Metropolitan Law Enforcement Council conducted a mass arrest in the area 16 Renmar Avenue in Walpole. In recent weeks, officers in Walpole responded to this area for numerous complaints of off road vehicles being operated recklessly. The officers noted that on these occasions, the offending parties were from the Boston area and had ties to a group named Boston Bike Life. Walpole and Boston Police then opened up lines of communication and put a plan in motion which was executed Sunday evening. As a result, seven individuals were summonsed to appear in court while fourteen were placed under arrest. Officers also impounded six motor vehicles and eleven dirt bikes and all terrain vehicles. All parties will appear in Wrentham District Court on numerous motor vehicle charges. In response to growing community unrest and complaints about the careless and reckless operation of recreational vehicles - specifically dirt bikes and motor scooters - on our city streets, the Boston Police Department in collaboration with several outside law enforcement agencies including the MA Environmental Police will initiate a significant and substantial crackdown targeting the reckless and illegal operation of unregistered motor scooters, dirt bikes, and recreational vehicles. Starting tomorrow, Saturday, May 14, 2016, and in the upcoming weekends in May, officers will conduct major operations inside the city to stop, ticket, and/or arrest those operating the above-mentioned vehicles in a manner that cause and create a danger and disturbance to the citizens of our fine city. Officers will direct their patrols and enforcement to neighborhoods that have elicited substantial complaints in the past, including, but not limited to Roxbury, Mattapan, Dorchester, Jamaica Plain and the South End. The BPD kindly asks and encourages community members to anonymously contact CrimeStoppers at 1-800-494-TIPS (8477) or text the word ‘TIP’ to CRIME (27463) with any information regarding the illegal operation or storage of these vehicles. The Boston Police Department will stringently guard and protect the identities of all those who wish to help this investigation in an anonymous manner. In response to growing community complaints, the Boston Police Department in collaboration with several outside agencies including the MA Environmental Police, will initiate a substantial crackdown on the reckless and illegal operation of unregistered motor scooters, dirt bikes, and recreational vehicles. In the upcoming weekends in May, officers will conduct major operations inside the city to stop, ticket, and/or arrest those operating the above vehicles in a manners that cause danger and disturbance to Boston communities. Officers will direct their patrols and enforcement to neighborhoods that have elicited substantial complaints in the past, including but not limited to Roxbury, Mattapan, Dorchester, Jamaica Plain, and the South End. The BPD encourages community members to contact CrimeStoppers at 1-800-494-TIPS (8477) with any information regarding the illegal operation or storage of these vehicle. The Boston Police Department, in partnership with the Massachusetts Environmental Police, continue their efforts to stop off road vehicles from operating on the streets of Boston. 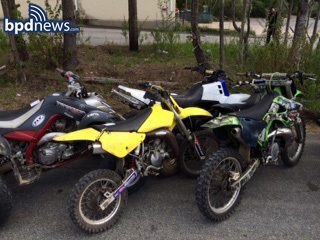 On Wednesday, April 20, 2016, members of the Boston Police Auto Theft Unit seized three dirt bikes and arrested a juvenile suspect in the area of 184 Greenfield Road in Mattapan. The officers were on directed patrol in response to numerous community complaints about off road vehicles operating dangerously throughout this section of the city. The officers observed three juvenile males operating three dirt bikes on Blue Hill Avenue in an unsafe manner. The operators were seen weaving in and out of traffic, failing to stop for signs and signals and “popping wheelies” as they rode down the busy street. The officers followed the bikes until they abruptly pulled onto a sidewalk and into a driveway where they came to a stop. Officers spoke to the three juvenile operators and as a result, one was placed in custody without incident while two were summonsed to appear in court on numerous motor vehicle charges. The dirt bikes were seized and impounded. 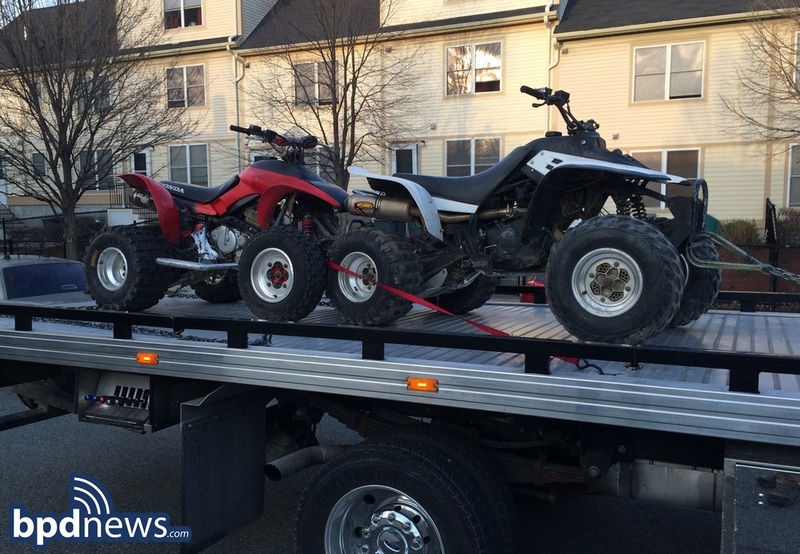 Commissioner Evans continues to encourage members of the community to call the police if they observe these kind of off road vehicles operating in an unsafe manner or if they are aware of any locations where they are being stored in the City of Boston. Community members wishing to make an anonymous tip can do so by calling the CrimeStoppers Tip Line at 1 (800) 494-TIPS or by texting the word ‘TIP’ to CRIME (27463). The Boston Police Department will stringently guard and protect the identities of all those who wish to help in an anonymous manner. On Wednesday, April 13, 2016, members of the BPD Auto Theft Unit along with members of the Massachusetts Environmental Police were on patrol in District B-3 (Mattapan) area in response to numerous community complaints about off road vehicles operating dangerously throughout this section of the city. As officers patrolled, they observed a male operating a red and white dirt bike on Blue Hill Avenue. Over the course of several blocks, officers observed the operator run multiple red traffic signals, “pop wheelies” and stand on the seat of the bike, ride off road through a park crowded with children, weave between vehicles, and cause operators of other vehicles to slow or stop in traffic to avoid hitting or causing injury to the bike operator. Officers finally found an opportunity to safely stop the dirt bike motorist. As the officers approached, the operator revved the bike’s engine as if attempting to flee or run the officers over. For their safety, the officers grabbed the brake handle of the bike and the vehicle stalled. The operator could not produce a valid license to ride a motorcycle at that time. Officers arrested the operator, 27-year-old Eric D. Lott of Dorchester, and charged him with Unlicensed Operation of a Motorcycle, Negligent Operation of a Motor Vehicle/Driving to Endanger, and Disorderly Conduct. He was also cited for Operation of an Unregistered Motorcycle on a Public Way, Operation of an Uninsured Motorcycle on a Public Way, Operation of a Motorcycle without a Helmet, Red Light Violations, and Operation of a Recreational Vehicle on a Public Way. At about 3:40 PM on Thursday March 17, 2016, officers assigned to the Auto Theft Unit impounded two dirt bikes and placed two suspects in custody in the area of 1 Shuyler Street in Dorchester. The officers were on directed patrol in the area in response to numerous recent complaints of recreational and off road vehicle being operated illegally on city streets. The officers observed the suspects, Samuel Bordoy, 21, of Boston and Eddie Lara, 21, of Roslindale, riding two dirt bikes at a high rate of speed, nearly hitting several pedestrians and other vehicles while weaving through lanes of traffic in the area of Seaver Street and Blue Hill Avenue. Officers activated their lights and sirens in an attempt to pull them over but were unsuccessful. Officers continued to follow the bikes until they saw them pull into the backyard of 1 Shuyler Street where they were able to stop the suspects and place them in custody without incident. The two suspects were issued numerous traffic citations and will appear in Roxbury District Court on charges of Failure to Stop for a Police Officer, Negligent Operation, Trespassing, Disorderly Conduct, Operating a Motorcycle with a Class D License and Operating an Uninsured Motor Vehicle. With the return of warm temperatures on Wednesday, March 9, 2016, also came the return of dirt bikes and all-terrain vehicles operating recklessly on city streets. 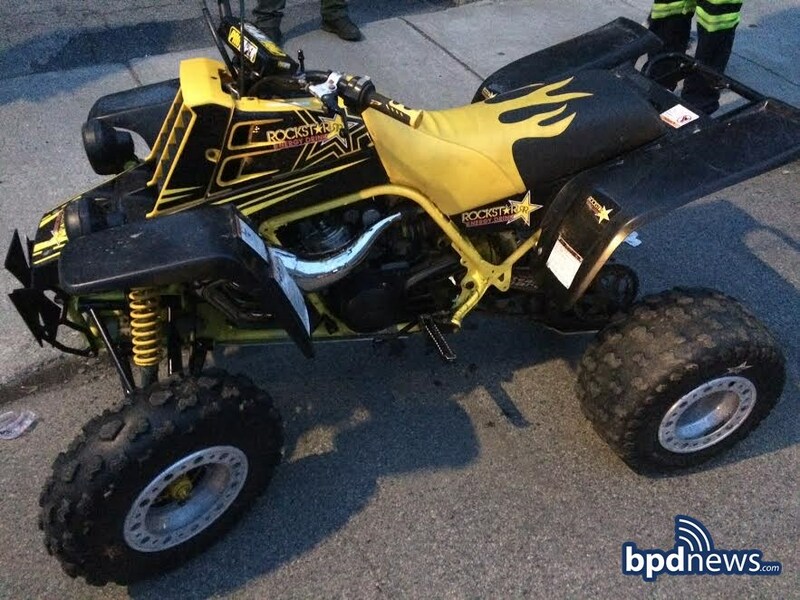 Investigators assigned to the Boston Police Auto Theft task Force were able to impound two ATV’s and one dirt bike during two separate incidents in Mattapan. Numerous citations were issued and one of the operators, Freddie Evans, 31, of Dorchester was placed under arrest without incident. That operator has been arraigned in Dorchester District Court on multiple motor vehicle charges including Unlicensed Operation of a Motor Vehicle, Operation of an Off Road Vehicle on a Public Way and Negligent Operation of a Motor Vehicle. Commissioner Evans continues to encourage members of the community to inform the police if they observe these kind of off road vehicles operating on the street or if they are aware of any locations where they are being kept within the City of Boston. At about 4:14 PM on Monday, February 1, 2016, officers from District B-2 (Roxbury) responded to a call for a large group of dirt bikes distressing motorists and disrupting traffic in the area of Atherton Street in Roxbury. On arrival, officers learned that the dirt bikes were last seen near a U-Haul storage facility in the area of 989 Mass Ave. 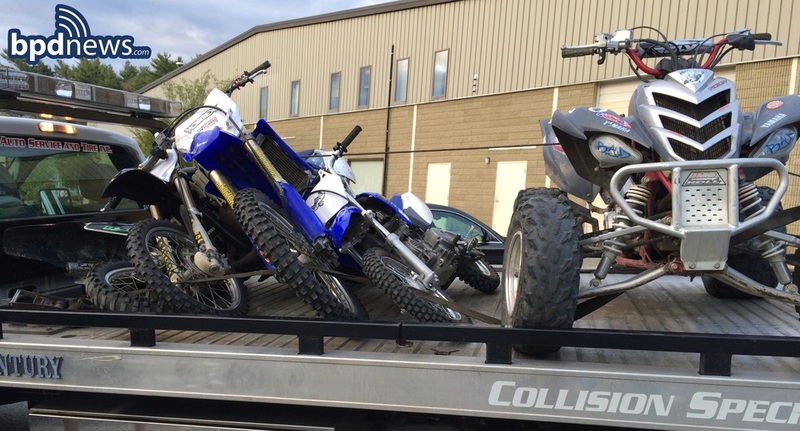 While canvassing the area, officers observed a blue Yamaha dirt bike in front of a U-Haul container and a male pushing a second dirt bike into the storage facility. Officers promptly stopped their cruiser to further investigate their observations. A search of the containers enabled officers to see and seize nine off-road vehicles including several dirt bikes and motor scooters. Additionally, officers observed several improperly stored gas cans. In light of the obvious and immediate fire hazard presented by the gas cans, Boston Fire and Boston Police Hazmat Units were promptly called to the scene. Once on scene, Boston Fire ordered the vehicles, all nine of them, to be removed from the property. Officers also received information indicating that several of the bikes may have been stolen. The incident remains under investigation and no arrests have been reported at this time. At about 6:25 PM Sunday, October 25, 2015, Investigators assigned to the Boston Police Auto Theft task Force, officers from District B-3 (Mattapan) and Massachusetts Environmental Police Officers arrested seven suspects while seizing seven dirt bikes at two separate locations in Mattapan. Officers were conducting surveillance of a large group of off road vehicles which were operating in violation of the auto laws and refusing to stop for police. Officer across the city have received numerous complaints from residents regarding the wantonly reckless behavior of such groups. Officers followed five of the riders to the rear parking lot of a building at 1020 Harvard Street where they observed the suspects loading the bikes into the back of a U-Haul truck. Officers placed all five suspects in custody without incident and seized the dirt bikes as well as the U-Haul truck and a pickup truck belonging to one of the suspects. The suspects were identified as Jonathan Frye, 26, of East Falmouth, Brenden Mendes, 21, of Wareham, Casey McElroy, 28, of East Falmouth, Sean Aylmer, 18, of Cataumet and Domenick Hicks, 19, of Mashpee. The suspects will appear in Dorchester District Court on multiple motor vehicle violations including Operating a Motor Vehicle without a License, Failure to Stop for a Police Officer and Driving to Endanger. As those suspects were being placed under arrest, additional units observed two other suspects placing their dirt bikes into the rear bed of a pickup truck in the area of 24 Tennis Road. Officers stopped the truck nearby on Almont Street and placed both suspects in custody without incident. Officers then seized the two bikes and towed the pickup truck. The suspects were both identified as 17 year old juvenile males, one from Canton the other from Abington. The suspects will appear in Dorchester Juvenile Court on multiple Delinquent to Wit motor vehicle violations. 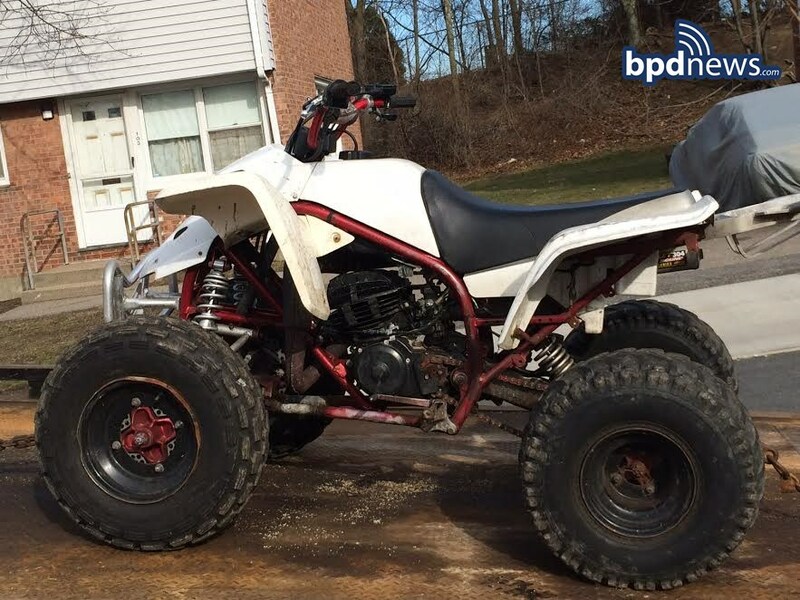 These arrests come after a summer long effort to address quality of life issues pertaining to the unlawful operation of these kind of off road vehicles on the streets of Boston. After listening to concerns from residents throughout the city, Commissioner Evans made it a priority to take these dirt bikes, motor scooters and ATV’s off the streets and out of the neighborhoods. To date, the Boston Police Department has seized over two hundred of these vehicles in a coordinated effort involving the Boston Police Auto Theft Unit, HAZMAT Unit, the Environmental Police, the Boston Fire Department and the City of Boston Inspectional Services Unit. Commissioner Evans continues to encourage the community to inform the police when they observe these types of dangerous vehicles and to report any locations where they may be stored. Community members wishing to make an anonymous tip can do so by calling the CrimeStoppers Tip Line at 1 (800) 494-TIPS or by texting the word ‘TIP’ to CRIME (27463). The Boston Police Department will stringently guard and protect the identities of all those who wish to help in an anonymous manner. At about 10:20 AM on Friday, October 23, 2015, officers from District C-11 (Dorchester) accompanied members of the Boston Fire Department to investigate a strong odor of gasoline emanating from a residential property located at 157 Adams Street in Dorchester. On arrival, officers were able to trace the smell of gasoline to the rear of the location. A search of the rear of the property enabled officers to locate six dirt bikes and one four wheel motor bike. Several of the bikes appeared to be in some state of disrepair. When officers attempted to locate the owners of the dirt bikes, no persons on the property claimed ownership of the bikes. In light of the aforementioned, the bikes were towed from the property and impounded. Officers have received numerous complaints from community members relative to bike thefts, as well as, the recklessly dangerous manner in which many of them are operated on our city streets. The Boston Police Department is actively reviewing the facts and circumstances surrounding this incident. Anyone with information is asked to call District C-11 (Dorchester) at (617) 343-4524.